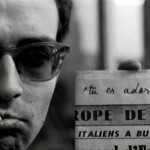 ☛ Paris nous appartient (Paris Belongs to Us) by Jacques Rivette, 1961 (01:18:02) A still frame from Jacques Rivette’s film Paris Belongs to Us shows Jean-Luc Godard as he holds a newspaper where he wrote “Tu es adorable” (You are adorable). Watch the whole film on MUBI. First spotted via Damian Hade photostream on Flickr.